It might be here or might not be here. El Berka was built by Yusuf Dey in 1612 and was meant to sell slaves coming from the Sub-Saharan Africa. Slaves of European origin, considered rarer and more precious, were not sold in the souk but in private locations because the sale concerned only wealthy potential buyers. This souk turned into a jewelers’ souk after the abolition of slavery in Tunisia, decreed by Ahmad I ibn Mustafa in 1846.
c.1910 or a bit earlier. Foreign and Commonwealth Office to the right. Various buildings to the left. The main image for St James Park on Wikipedia shows the same view. The city served as a major military installation for the British Raj, primarily due to its proximity to Goa, which was then a Portuguese territory. Once the British left India, the Indian government continued and still continues to have armed forces installations in Belgaum. Belgaum’s salubrious climate, proximity to the coast and strategic position near Portuguese Goa commended it to the British as a suitable location for an army training centre and cantonment, which it continues to be today for the Indian Armed Forces, along with an air force station of the Indian Air Force. The British had a sizeable infantry post here, having realised the military importance of its geographical location. This map of Belgaum (from Wikipedia Commons) shows the location of various military camps around the city (which can be match to locations on Google Maps (e.g. “New Artillery Barracks” is the same area as “BM School Playground”). Which particular camp the postcard is showing is a little harder to determine. 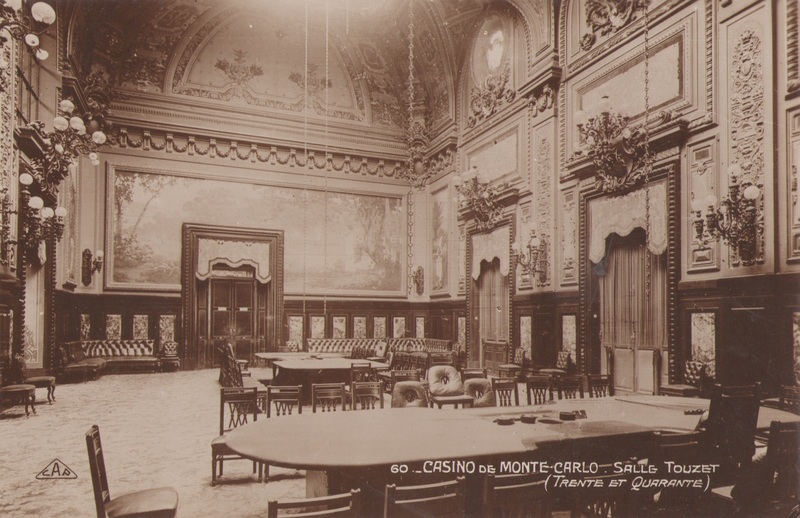 Monte-Carlo. — Façade nord du Casino. Virtual tour (once inside, the grid in the top left is the easiest way to get around). The idea of opening a gambling casino in Monaco belongs to Princess Caroline, a shrewd, business-minded spouse of Prince Florestan I. Revenues from the proposed venture were supposed to save the House of Grimaldi from bankruptcy. The ruling family’s persistent financial problems became especially acute after the loss of tax revenue from two breakaway towns, Menton and Roquebrune, which declared independence from Monaco in 1848 and refused to pay taxes on olive oil and fruit imposed by the Grimaldis. In 1854, Charles, Florestan’s son and future Prince of Monaco, recruited a team of Frenchmen—writer Albert Aubert and businessman Napoleon Langlois—to devise a development plan and write a prospectus to attract 4 million francs needed to build a spa for the treatment of various diseases, a gambling casino modeled from the Bad Homburg casino, and English-styled villas. Granted the concession of 30 years to operate a bathing establishment and gaming tables, Aubert and Langlois opened the first casino at 14 December 1856 in Villa Bellevu. Intended to be only a temporary location, the building was a modest mansion in La Condamine. In the late 1850s, Monaco was an unlikely place for a resort to succeed. The lack of roads needed to connect Monaco to Nice and the rest of Europe, and the absence of comfortable accommodations for visitors, as well as the concessionaires’ failure to publicize the new resort, resulted in far fewer customers than was originally anticipated. Unable to raise the capital needed to operate the money-losing enterprise, Aubert and Langlois ceded their rights to Frossard de Lilbonne, who in turn passed it to Pierre Auguste Daval in 1857. Trente et Quarante (Thirty & Forty) is a French card game Wikipedia article.